This view looks west along California 16 (Jackson Road) just after the Grant Line Road intersection in Sacramento County. California 16 travels northwest along Jackson Road until the intersection with Howe Avenue and interchange with U.S. 50 (El Dorado Freeway). Photo taken 03/15/15. California 16 is currently divided into two segments. The western segment of California 16 begins at its junction with California 20 just east of Clear Lake, then heads southeast via Cache Creek Canyon to Rumsey, Esparto, and Woodland. The state route ends at Interstate 5 north of Woodland. The eastern segment of California 16 begins at its junction with U.S. 50 in Sacramento at Exit 9 and follows Howe Avenue and Jackson Road east to California 49 near Plymouth. Portions of the state route nearest U.S. 50 within the city of Sacramento are being considered for transfer to local jurisdictions for operations and maintenance. A portion of California 16 overlapped with former California 24 northwest of Sacramento. 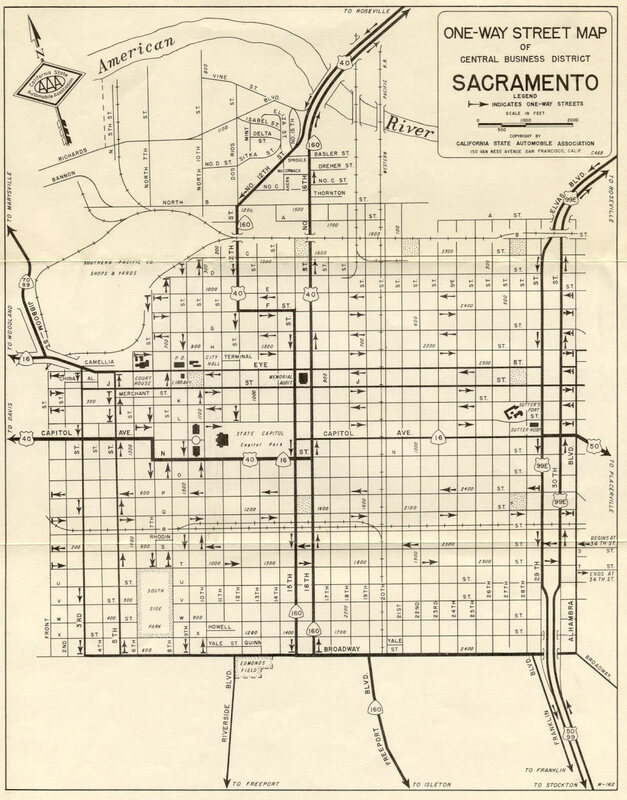 A later realignment may have moved California 24 (and definitely California 70) away from former California 16 and onto Garden Highway (which follows the east bank of the Sacramento River) and possibly Jibboom Street to link with the downtown Sacramento street grid. In 1964, California 24 was removed from Sacramento, and Californio 70 was commissioned to follow the Jibboom Street and Garden Highway route leaving Sacramento to the north (see 1968 CSAA map of Sacramento below); its southern terminus was later truncated north to its split from California 99 northeast of the Sacramento International Airport. California 16 more or less remained on its route. 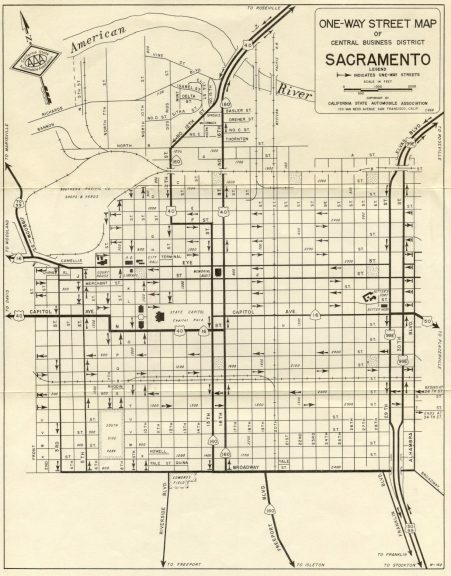 Regardless, with the completion of the central Sacramento freeway network, the state route designation along these streets became less necessary and redundant in keeping with California's general philosophy (post-1964) about limiting parallel state routes and removing urban streets from the state route system when possible. In 1984, California 16 was removed from the local street network. After California 16 was removed, some maps show California 16 following the freeway network via Interstate 5, Business Loop I-80 (Capital City Freeway), and U.S. 50 between Woodland and Sacramento, but it is unclear if California 16 was ever signed along this route. Some remnant signage for California 16 remained in downtown Sacramento as late as the 1990s, but it apparently is gone as of 2015. Map courtesy of Joel Windmiller, member of the California Lincoln Highway Association. California 16 east at Willow Creek Road. Photo taken 03/29/01. California 16 turns north at Yolo County E-7 in Woodland. 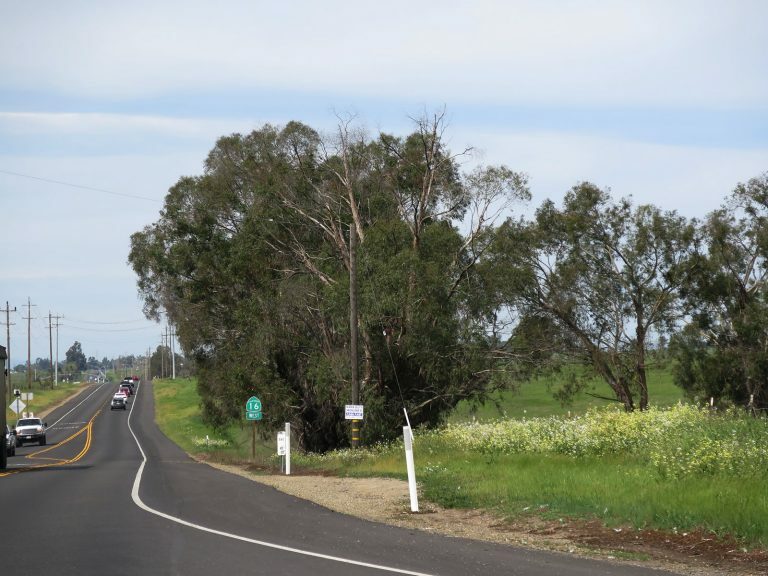 Paralleling the California 113 freeway, Yolo County E-7 travels south along Road 98 and Pedrick Road toward Davis. Photo taken 03/29/01. An I-5 trailblazer directed motorists onto SR 16 leading north from Main Street (Business Loop I-5) in Woodland. Photo taken 2002. The eastern segment of California 16 concludes at the six-ramp parclo interchange joining Howe Avenue with U.S. 50. A ground level button sign previously directly motorists onto the U.S. 50 freeway to Placerville and Sacramento. A new overhead assembly and end shield were added here by 2011. Photo taken February 2000. Approaching the six-ramp parclo interchange with Interstate 505 along California 16 west in Yolo County. Photo taken 03/29/01. I-505 travels south to Vacaville while California 16 continues west into the unincorporated community of Madison. Photo taken 03/29/01. California 16 west at Yolo County E-4 north near Capay. Rumsey is the last in a string of towns along California 16 west in Cache Creek Canyon. CR E-4 travels 17 miles north to Dunnigan, where it ends at Interstate 5. Photo taken 03/29/01. February 2000 by Dominic Ielati.